(*) Meteorologic data from our own meteorological station in Destnice near Saaz. Compared to the long-term average July was just slightly below normal as fas as precipitation and temperature is concerned. By the end of the month habitus of plants was sharp on substantial part of the gardens. Majority of vegetation is already in the phase of cones creation. During the month on July the chemical protection of hops was performed. It was concentrated especially against hop aphid, red spider mite and downy mildew of hops depending on situation in individual locations. Health state of hops is very good. The beginning of the harvest can be expected as usual around 20th August according to the contemporary state of the vegetation. So far the average yield of Saaz semi-early red-bine hops is expected. It is too early for making more exact estimation of the yields. 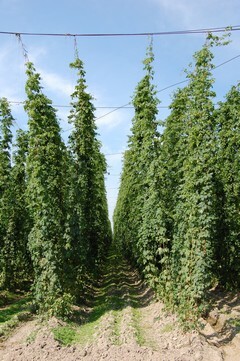 The photo enclosed shows the state of hop gardens by the end of July.